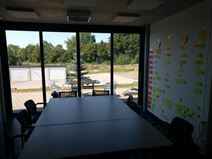 Office Space - Heimsheim, Baden Wurttemberg. These offices are situated in the heart of the automotive industry, close to Stuttgart Airport and Trade Fair. These are brand new office, providing flexibility, high efficiency and a host of amenities in a comfortable business environment. Your business can take advantage of this centre's extensive selection of facilities and support services. There are meeting and training rooms available, as well as a kitchenette.